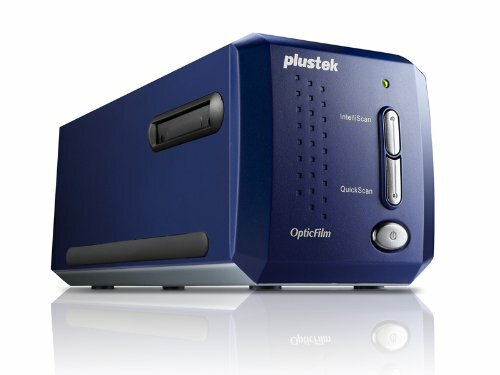 The Plustek OpticFilm 8100 is a dedicated and versatile film scanner with 7200 dpi optical resolution. Its light sources give images more precise color rendering with less power consumption. Two one-touch buttons make scanning easier and more efficient for sharing on websites such as Flickr, Facebook, Picasa, etc.Compared with the conventional flatbed scanners, the Plustek OpticFilm 8100 provides a much smaller footprint. The scanner is about the same size as a loaf of bread and takes less space on one’s desktop. All OpticFilm scanners also include a custom carrying bag that can be used for transportation or storage.The Plustek OpticFilm 8100 and SilverFast software make a perfect combination. SilverFast Multi-Exposure is especially for increasing the dynamic range, which adds more shadow details and eliminates noise. SilverFast NegaFix with over 120 profiles for negative film guarantees best results when converting negatives into brilliant positives.The Plustek OpticFilm 8100 scanner is bundled with the newest version of LaserSoft Imaging’s acclaimed scanner software - SilverFast 8. Its WorkflowPilot® guides users through all scanning and processing steps. The new developed graphical user interface is more intuitive and easy to use. Meanwhile, multitasking capable and 64-bit hardware support is extremely fast and efficient. With the Plustek OpticFilm 8100 it is easier than ever to get started. It is the ideal film scanner for a wide range of users, including home users, lomographers, small office / workshop users, amateur photographers and photographers.